The U.S. government seems concerned about what will happen if other big nations push down the value of their currencies against the dollar. Actually, it could be good for the global economy. Ahead of this week’s meeting of finance ministers from the Group of Seven developed nations, Treasury Secretary Jacob Lew has warned that the U.S.’s counterparts — the three largest euro-area nations plus Canada, Japan and the U.K. — might undermine global growth if they engage in policies that cause their currencies to depreciate against the dollar. In my view, his concerns are misplaced. The US has selectively (and Japan in the 1980s is the “representative” example) over time “warned” countries about letting their currencies depreciate against the dollar. The US position as a “monetary superpower” indicates that it dictates to a large extent the world´s currency “configuration”. 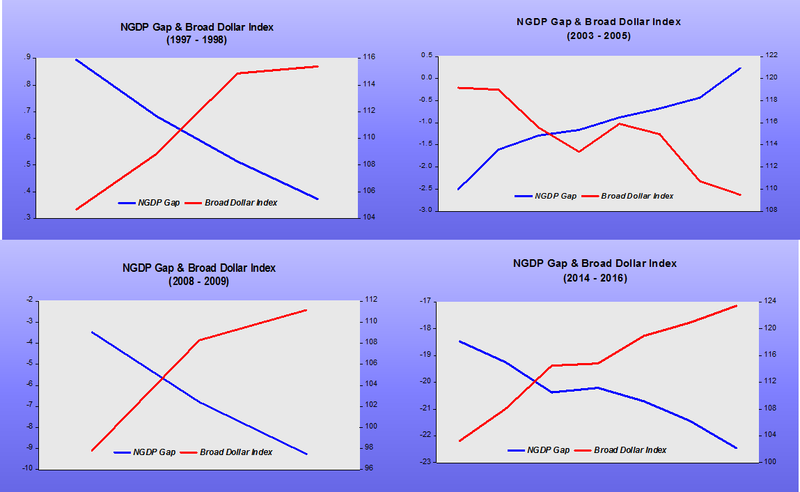 The charts below show, through some examples, how US monetary policy has ‘shaped’ the broad dollar index over time. Whenever US monetary policy is tightened (measured by an enlargement of the NGDP ‘gap’ relative to the “Great Moderation” trend, or a narrowing if coming from above), the dollar appreciates relative to a broad basket of currencies. If US monetary policy is “eased” (measured by the NGDP ‘gap’ narrowing, or enlarging if from above trend), the dollar depreciates. When finance chiefs and central bankers from the Group of Seven countries gather this week at a hot springs resort in northern Japan, the official agenda has them focusing on ways to revitalize global growth and crack down on cross-border tax evasion. Left off the discussion list is one of the most pressing concerns for the host nation: how to counter a 10 percent surge in the yen that’s squeezing an economy unable to escape a cycle of expansion and contraction. Cries for sympathy are likely to fall on deaf ears, given the tailwind corporate Japan got in the first years of the Abe administration from the currency’s sharp depreciation. 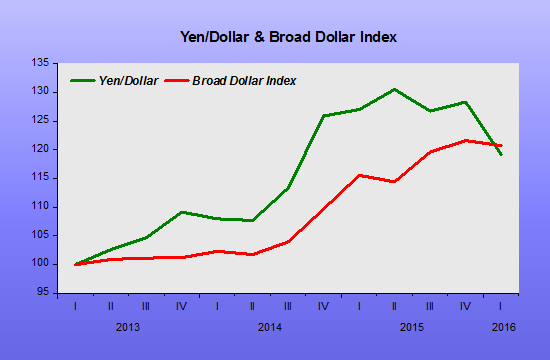 As the chart indicates, Abenomics was successful from inception because the expansionary monetary policy undertaken by Abe/Kuroda managed to depreciate the Yen by more than the Broad Dollar Index. But more recently, while Japan´s monetary policy has faltered, the US has relented on “tightening” (although this seems to have changed as indicated by the Minutes released yesterday). That was a “deadly” combination from Japan´s perspective. In short, Japan did it to itself! If the US “tightening bias” is resumed and Japanese monetary policy makers rethink their strategy, the Yen will again depreciate. If the FOMC “lightens-up” again, as it did earlier this year, Japan´s monetary policy will have to be even “braver”! From the mid-1980s through 2008, central banks had the tools, the will, and the knowledge to protect the economy from sharp swings in the demand for goods and services. They raised interest rates to head off surges, and lowered rates to prevent severe slumps. As a result, households and businesses could count on an economy in which aggregate demand grew relatively steadily. Nobody had to think about, or plan around, the possibility of persistent shortfalls in prices and employment. That has changed. Since 2008, central banks haven’t been able or willing to defend against a sharp and highly persistent fall in aggregate demand. They have used much of their toolkit, and seem reluctant to employ the tools that remain. As a result, the flow of demand has become uncertain. Market participants and others are focused on what could go wrong, and how central banks might — or might not — respond. Before 2008, global aggregate demand was like electricity in the U.S. — just something in the background that everyone could count on. After 2008, it became like electricity in India — desperately needed, but subject to random and persistent shortages. Just as the uncertainty of electricity provision hobbles India’s economy, the uncertainty of aggregate demand impairs the global economy. To reduce uncertainty and promote higher growth, both systems need overhauls. How should the world overhaul its system for providing aggregate demand? To me, this is the key question facing macroeconomists today. Answering it will require a big change in the discipline. Before 2008, most macroeconomists studying the U.S. and Europe largely ignored the possibility of long-lasting shortfalls in demand. This may (at least arguably) have been appropriate for most questions of interest before 2008. Now, however, they need different models and approaches to understand the effects of aggregate-demand uncertainty, and figure out how best to eliminate it. The chart gives a visual of Kocherlakota´s ‘allegations’. But note, after 2007 NGDP growth was initially quite unstable, “running off at high speed” through the Southwest corner of the “stability compound”. Contrast that with NGDP “running off at high speed through the Northeast corner of the “stability compound” in 1970 -84. While the 1970s defined the “Great Inflation”, the 2008-09, by symmetry, characterized a strong disinflation period. In 1985 – 07, aggregate demand growth is contained wholly within the “stability circle, and we had the “Great Moderation”. Again note that contrary to Kocherlakota´s musings, after the “recovery” from the Great Recession was established in early 2010, what we observe is a very stable aggregate demand growth and not random and persistent shortages”. However, given the low level of NGDP and it´s rather low average growth, the post 2010 period could be called “Depressed Great Moderation”! From that perspective, again contrary to Kocherlakota, there´s no need to “overhaul the system for providing aggregate demand”, and also no “big change in the discipline” is required. 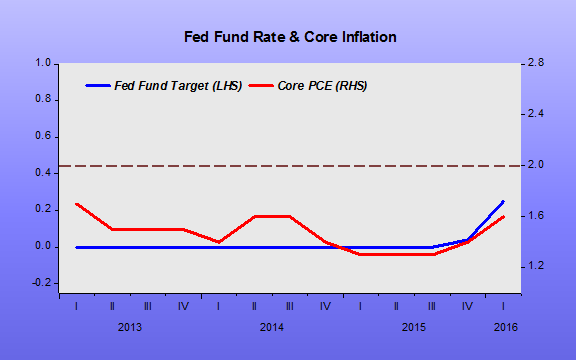 It is clear that the Fed can target NGDP growth at a stable rate. After all that´s what it did from 1985 to 2007 and from 2010 to 2015. What´s missing now is the definition of an adequate NGDP level and the most promising growth rate along that level path. If that´s done the economy will, once again, prosper in a state of nominal stability. By two former central bankers. So, going negative is daring but appropriate monetary policy. But it is a sign of a terrible policy failure by fiscal policymakers. The reason that the FOMC has to go negative is because the natural real rate of interest r* (defined to be the real interest rate consistent with the FOMC’s mandated inflation and employment goals) is so low. The low natural real interest rate is a signal that households and businesses around the world desperately want to buy and hold debt issued by the US government. (Yes, there is already a lot of that debt out there – but its high price is a clear signal that still more should be issued.) The US government should be issuing that debt that the public wants so desperately and using the proceeds to undertake investments of social value. But maybe there are no such investments? That’s a tough argument to sustain quantitatively. The current market real interest rate – which I would argue is actually above the natural real rate r* – is about 1% out to thirty years. This low natural real rate represents an incredible opportunity for the US. We can afford to do more to ensure that all of our cities have safe water for our children to drink. We can afford to do more to ensure that our nuclear power plants won’t spring leaks. We can afford to do more to ensure that our bridges won’t collapse under commuters. These opportunities barely scratch the surface. With a 30-year r* below 1%, our government can afford to make progress on a myriad of social problems. It is choosing not to. If the government issued more debt and undertook these opportunities, it would push up r*. That would make life easier for monetary policymakers, because they could achieve their mandated objectives with higher nominal interest rates. But, more importantly, the change in fiscal policy would make life a lot better for all of us. It won’t work. Negative central-bank interest rates will not create growth any more than the Federal Reserve’s near-zero interest rates did in the U.S. And it will divert attention from the structural problems that have plagued growth here, as well as in Europe and Japan, and how these problems can be solved. Part of the impetus behind a central bank’s negative interest-rate policy is a desire to devalue the currency. With lower market interest rates, holders of euros, for example, may sell them to flee to countries with higher interest rates—driving down the euro’s exchange rate, boosting European exports and growth. But it is impossible for every country in the world to depreciate its currency relative to others. If the European Central Bank hopes to force euro depreciation against the yen and the Bank of Japan hopes to force yen depreciation against the euro, one or both of the central banks will fail. Where central banks can help is by identifying the structural impediments to growth and recommending a way forward. In the U.S., Congress should force the Federal Reserve to come clean about why growth has been so slow. The forthcoming congressional monetary policy oversight hearings—Feb. 10 for the House Financial Services Committee and Feb. 11 for the Senate Banking Committee—are the right place to explore what is wrong with the U.S. economy. These committees ought to insist that the Fed, with its large and expert staff, present relevant studies by mid-June, in time for the annual oversight hearings in July. At the July hearings, the Fed can discuss its research. Academic and other experts can offer their analysis of the Fed’s findings. Instead of vague Fed statements about “headwinds,” the nation deserves solid empirical work on the problem. The Committee needs to change its basic policy framework. Monetary policy is not about targeting the level and volatility of interest rates. The FOMC needs to have a framework in which the fed funds rate (and its other tools) are much more responsive to its medium-term forecasts of inflation and employment shortfalls. Markets would then have to adjust to the possibility that interest rates might have to change rapidly, at any time and in either direction, if the FOMC believes that change is necessary to achieve its macroeconomic objectives more rapidly. 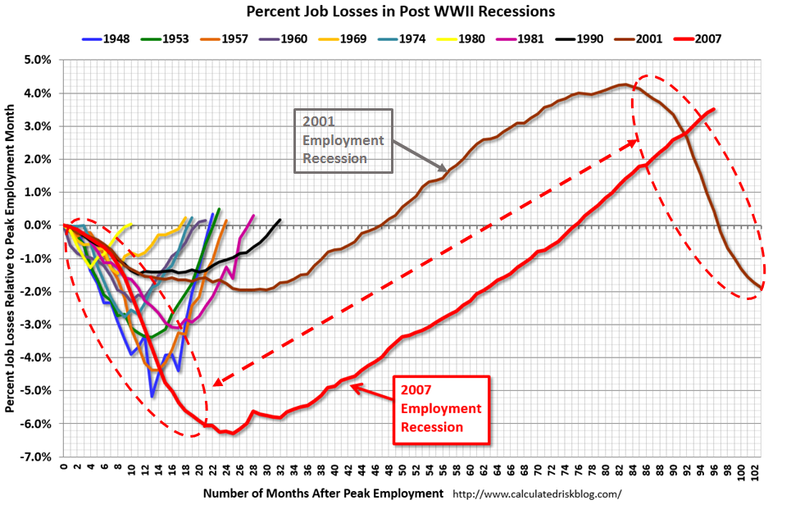 This graph shows the job losses from the start of the employment recession, in percentage terms, compared to previous post WWII recessions. Since exceeding the pre-recession peak in May 2014, employment is now 3.5% above the previous peak. Note: I ended the lines for most previous recessions when employment reached a new peak, although I continued the 2001 recession too. The downturn at the end of the 2001 recession is the beginning of the 2007 recession. I don’t expect a downturn for employment any time soon (unlike in 2007 when I was forecasting a recession). By choosing to break with the way he presented the chart originally, with lines ending when the previous employment peak was reached, he ‘pollutes’ the chart, and detracts attention from an interesting characteristic. Note that the 2001 Employment Recession is one of the shallowest, only less so than the 1990 Employment Recession; but the second most persistent, only less so than the present Employment Recession. What accounts for the depth and persistence of the employment recessions? 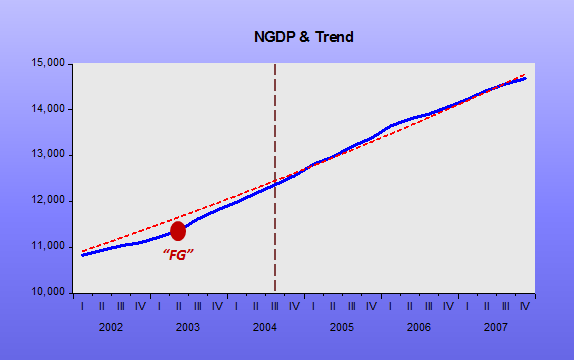 The short answer: monetary policy, whose stance is well described by the growth of NGDP. The chart below is a powerful illustrator. The 1981 employment recession was deep. 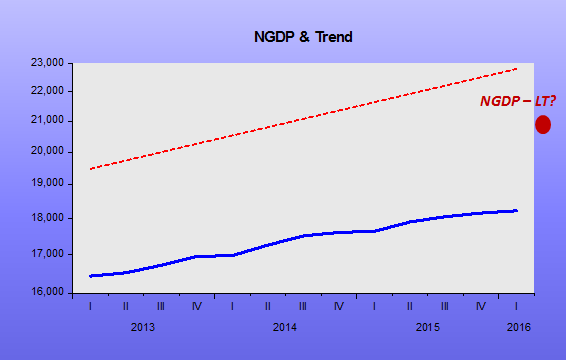 The fall in NGDP growth was high. 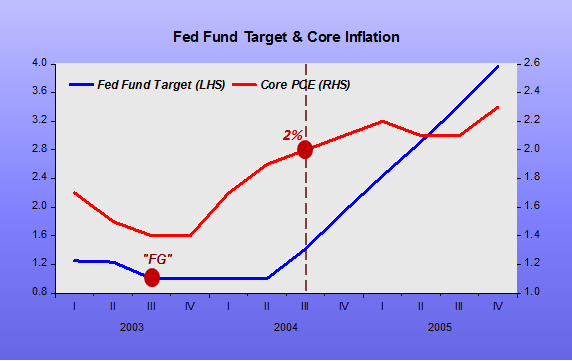 The objective of monetary policy at the time was to bring inflation down significantly. It came from double digit rates to the 3%-4% range. The intensity of the employment pick-up is commensurate with the strength of the rise in NGDP growth. 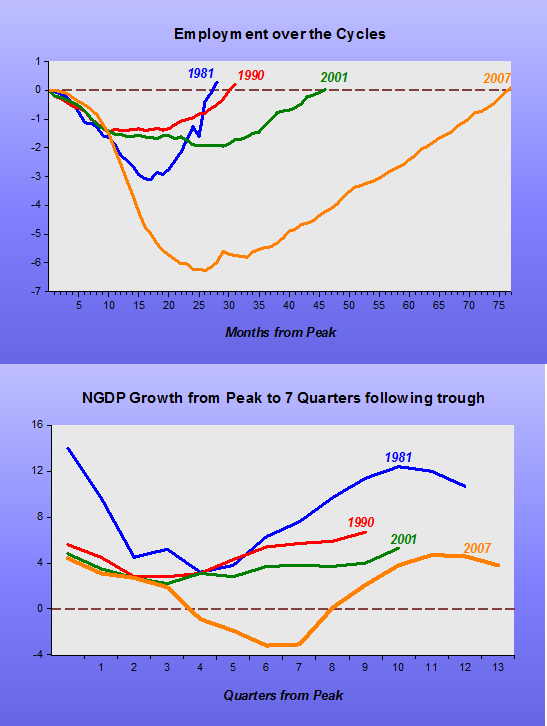 In the 1990 cycle, monetary policy was slightly less tight than in the 2001 cycle and NGDP growth increased sooner, making the 1990 cycle a little less deep and less persistent than the 2001 cycle. The 2007 cycle is the clincher, and “living proof” of the responsibility of monetary policy in generating the “Great Recession”. Note that for the initial months/quarters since the cycle peak, the fall in employment during the 2007 cycle was par with the fall in employment in the 1990 and 2001 cycles. 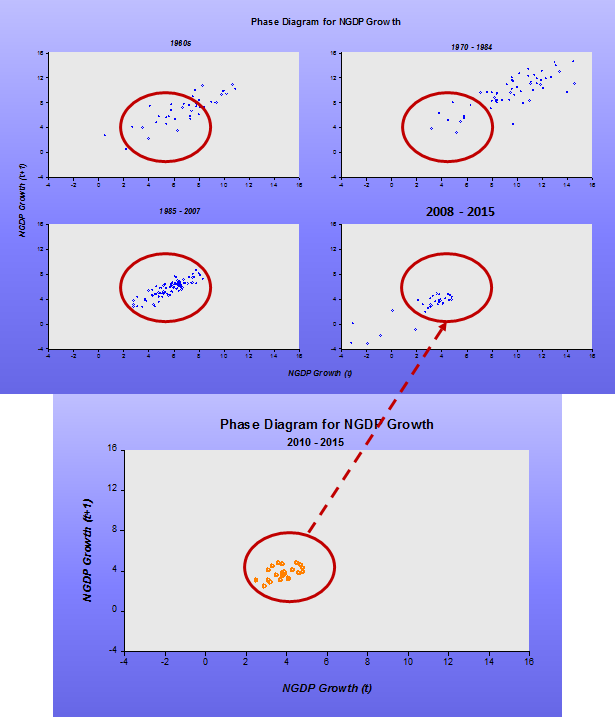 As should be expected, the behavior of NGDP growth during this stage was very similar in the three cycles. But suddenly the Fed makes the second largest error since its inception in 1913. 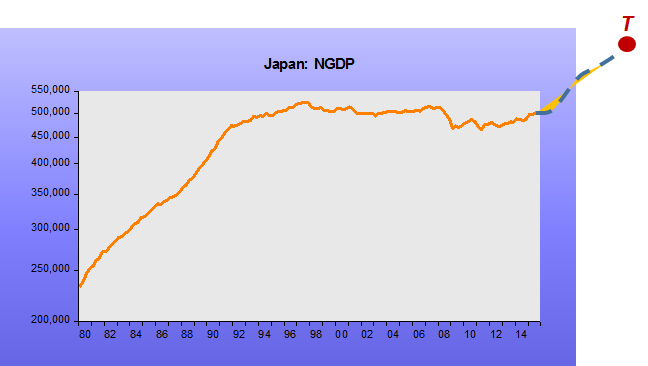 The massive drop in NGDP growth, which remains for an “eternity” in negative range, “destroys” employment. The timid monetary pick up, both in relative and absolute terms, fully explains the persistence of the employment recession in the present cycle. Decades in the future, when the history of the last 30 years will be written by dispassionate researchers, one interesting footnote will surely describe the “NK Trip”, where NK does not stand for “New Keynesian”, but for Narayana Kocherlakota and will show that the “last step” in the “trip” completely denies the “first step”. Furthermore, the “ingredients” deemed important in the stories told today: the house price boom & bust, “greedy bankers”, “spindrift consumers”, will be seen as bit players, in part victims of the monetary “mayhem” brought on by the Fed!